A marvelous book in the true dictionary sense of "marvel": it is a wonderful and astonishing thing, the kind of book that makes child laugh and adult chuckle, and both smile in appreciation. A charmingly wicked little book. Deliberately understated, with delectable results... Skillful characterizations; though they're simply drawn and have little to say, each animal emerges fully realized. You know, bears may stand for adults in some way, because they're big, they're ungainly, they're goofy. They're like most of us grownups. But the bear in this book paws down; he's got to be the dimmest, most slow-witted, brilliantly stupid bear to come along in years. I really love him. Four pages into this charmer, every kindergartner will know where the bear's missing hat is - but they'll never predict the hilarious revenge he takes on the thief. This is a familiar picture-book formula with a twist, and the minimalist style Klassen employs with both text and art only emphasizes the humor of the situation....While these design choices and the simplicity and pattern of the text would make this a good choice for beginning readers, it would also make an amusing readaloud or a great little readers' theater piece. Read I Want My Hat Back by Jon Klassen. It's the most subtle endorsement of murder you'll ever find. This is a must-have for any primary or even intermediate classroom. It's about inference and being a good reader. --The New York Times Deliberately understated, with delectable results... Skillful characterizations; though they're simply drawn and have little to say, each animal emerges fully realized. --Publishers Weekly (starred review) Read aloud, this story will offer many sublime insights into how young readers comprehend an illustrated text that leaves out vital information, and will leave young sleuths reeling with theories about what just happened. --School Library Journal Klassen's animation and design skills are evident on every page in this sly, subversive tale... Adults and older children will chuckle mordantly at rabbit's sudden disappearance, while young children might actually wonder, with Squirrel, where the rabbit has gone. --The Horn Book Indubitably hip, this will find plenty of admirers. 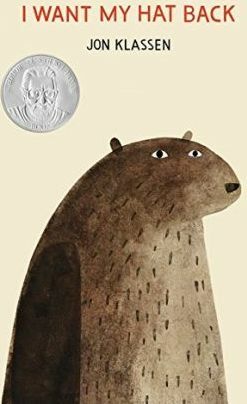 --Kirkus Reviews You know, bears may stand for adults in some way, because they're big, they're ungainly, they're goofy. They're like most of us grownups. But the bear in this book paws down; he's got to be the dimmest, most slow-witted, brilliantly stupid bear to come along in years. I really love him. --NPR Weekend Edition Four pages into this charmer, every kindergartner will know where the bear's missing hat is -- but they'll never predict the hilarious revenge he takes on the thief. --People Magazine A sly picture book...Young readers and listeners will love being in on the joke, making them appreciate the story's humor even more. --BookPage The joy of this book lies in figuring out the explicit plot from the implicit details in the pictures, especially a few wordless ones. --Chicago Tribune A coterie of woodland animals is drawn in a minimalistic style and a palette of browns with a splash of red. The dialogue is simple and sly. --The Boston Globe This is a familiar picture-book formula with a twist, and the minimalist style Klassen employs with both text and art only emphasizes the humor of the situation....While these design choices and the simplicity and pattern of the text would make this a good choice for beginning readers, it would also make an amusing readaloud or a great little readers' theater piece. --Bulletin of the Center for Children's Books Read I Want My Hat Back by Jon Klassen. It's the most subtle endorsement of murder you'll ever find. --GQ.com This is a must-have for any primary or even intermediate classroom. It's about inference and being a good reader.